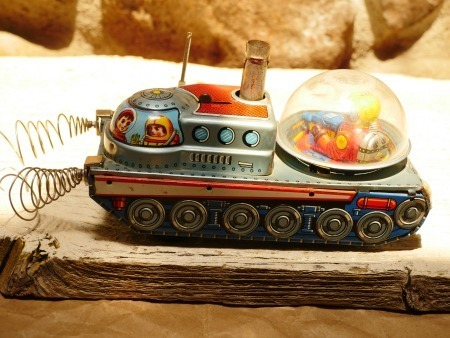 This month’s vintage highlight features every kid’s favorite thing: toys! Here you will find three vintage classics that Pickle Barrel has for the collectors out there. Wyandotte toys (pre-WWII) are highly sought after because of their durability. The toys are made from solid metal and often remain in good condition. 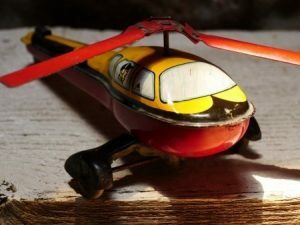 This particular helicopter was made in the early 1930s as one of the first non-gun toys provided by Wyandotte. The company was dominating the toy gun market and wanted to diversify their product lines to include girls’ products and vehicles. The helicopter is in really great condition; it’s only missing a rear propeller. Buy it here at Pickle Barrel today for only $130.00! The Wyandotte helicopter is metal and contains the original hand painted design. Kobo Yoko LTD was a famous Japanese toy company from 1950-1970 that created sci-fi inspired toys. They specialized in wind-up and mechanical products that stirred the imagination of children and adults alike. The wind-up Space Explorer is one of their more famous models, other than their classic knock-offs of Robby the Robot. The model we have here at Pickle Barrel is in excellent condition with all parts and original paint intact. Buy it online or in store for $200.00! The Yoshiya Space Explorer retains its original springs and paint. Joustra is a classic company famous for the mass production of tin toys. The monkey presented here was one of their first products from the early 1930s. This classic backflip monkey won the hearts of kids all throughout the world. Our single Backflip Monkey is kept in decent condition with just a little hint of rust on the front. Head over to our online store to make it yours for only $55.00. 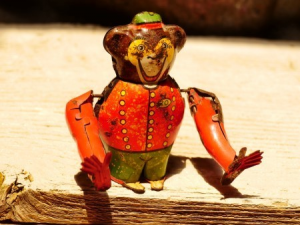 The Joustra Backflip Monkey has a little rust on the front, but otherwise is in good condition. These three toys once captured the hearts of kids when they were first released. Now, they need a home again where they can be truly appreciated. All of them are made by famous toy companies, all are in good to great condition, and all three can be yours today courtesy of The Pickle Barrel Trading Post!